Mr Dalziel and his family have farmed in East Ayrshire since the 1950s, and farming in the area presents numerous challenges, including threats to the region's internationally relevant wildlife. Eric Neilson earned a highly commended mention for transforming Meserhead Farm, formerly arable land, into a wildlife-rich coastal wetland, restoring watercourses and pools, installing sluices, clearing ditches and removing scrub. Professor Campbell said: "Food and farming are becoming even more important as Scotland aims to expand its food and drink sector, and this award recognises the people who are managing our farmland and producing food in ways that support nature." SNH Youth and Education: Reviving Rossie - Awakening a Secret Wood. 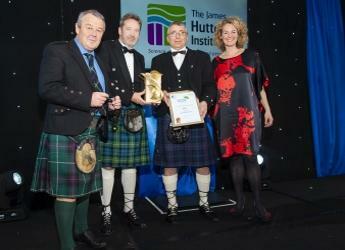 For more information about the Nature of Scotland Awards, visit the RSPB Scotland website.